It is that time of year again when I start getting a lot of calls and emails about installing epoxy in cold temperatures. The best time to protect your floor is before it sees any salt at all. If you have a new garage floor now is the time to protect it. It is still possible to do older floors but the more salt it sees the more difficult and expensive it can be. The night temperatures are dropping this time of year. It is still possible to coat your garage floor before temperatures drop too low. Our cold temperature epoxies will cure with substrate temperatures as low as 35 degrees F, although it will set a lot faster at 40 degrees F.
Protecting your garage floors is especially important in areas that will see salt from roads or ocean spray. 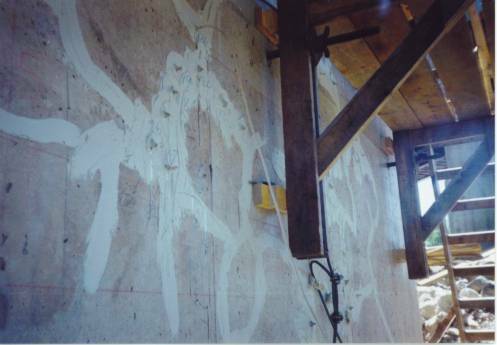 You will want to protect your garage from the ravaging effects of salt deterioration. Without protecting your floor salt will damage your garage floor and make for very expensive repairs later if it is not well protected. It is not too late to protect your floor even in cold climates if you move quickly now. Without this protection your garage floor will not be as nice come spring as it is now. The damage that takes place is not only aesthetic but structural. Product #1 Cold Temperature Cure Epoxy Coating is 100% solids and specially formulated coatings for cold temperature applications. Cold Temperature Epoxy Coating #1 is able to cure at temperatures as low as 35°F. It has Zero (0) VOCs. Since it has no VOCs, it has no solvent so it meets the strictest possible standard for a low VOC coating. It is often used in coolers and food preparation areas that require constant low temperatures. Product #1 Cold Temperature Cure Epoxy Coating is also frequently used in room temperature applications to meet super-fast cure, limited shutdown needs. Industrial and commercial floors take heavy abuse. The older the flooring the worse shape it is in. Conventional wisdom says that such a breakdown of the floor is inevitable. There are steps you can take to protect your floor before it gets damaged. Once the damage has happened there are steps you can take to permanently repair most damaged floors. Floor joints, are the source of many industrial flooring problems. The purpose of these joints (in original construction) is to give the concrete a controlled place for the concrete crack as it shrinks. They sometimes are called expansion joints. In theory they will expand when the concrete gets hot.Indoors, where temperature is somewhat stable, most of their function of these joints has ended after 28 days or so of concrete. Concrete does most of it shrinking in the first 28 days. The downside of these joints in the concrete is that it gives a place for the concrete to start chipping away. See the highlighted (in blue) corners in the illustration to the right. When wheels pass across the top it hammers the edge in the opposite side of traffic flow. This breaks off tiny pieces of concrete (again drawn in blue as a triangle at the edges of the concrete joint). The bigger the area chipped out earlier, the bigger and faster additional chipping happens. Time goes on and “pot holes”start to form in the concrete joint in direct proportion to the number of times wheels have hit a given spot.This can become a major trip and forklift hazard. Wheel Supported by #11 as it passes over the joint. eliminating the pounding and chipping effect on the sides of the joint. See in this diagram how the #11 supports the wheel as it passes over the joint. For application on flat surfaces Epoxy Joint Filler for Saw-Cut Control Joints Product #11 can be poured or pumped from an Epoxy.com Binary Pumping Systems. In areas where cosmetics are important mask both sides of the substrate before applying the material. If the areas are bigger you can use Epoxy.com Product #12 blended with silica sand to make a mortar to fill the pothole, then re-cut your joint with a concrete saw as shown in the diagram here. The Product #12 can also be mixed with silica sand and used to repair areas in the center of a slab that might have started as a random crack or because of a chemical spill or due to impact damage. If you need the epoxy mortar to set at a lower temperature and/or faster Epoxy.com Product #10 Epoxy Mortar Resin in fast or cold cure may be the best option. Here is an outline of getting your flooring ready and some of the types of flooring we can offer you. Fill joints with Epoxy.com Product #11 – epoxy.com/11.aspx.If there is spalling at the joint see “pot hole” repair below. Epoxy.com Product #899 – www.epoxy.com/899.aspx. 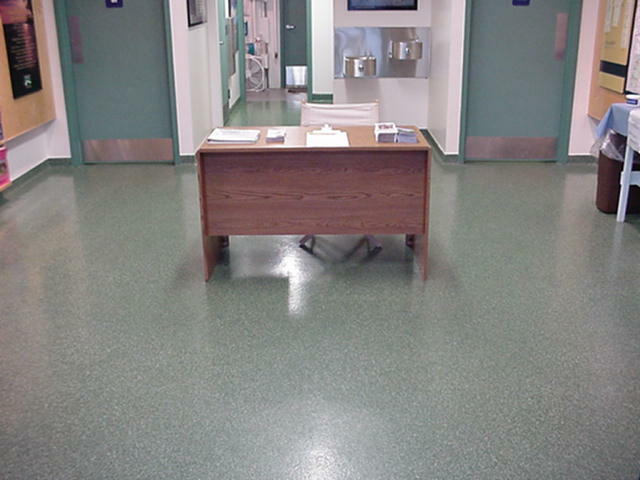 Epoxy Quartz Flooring – www.epoxy.com/15.aspx. Still not sure? Email epoxy.com Technical Support info@epoxy.com call us at 352-533-2167. We will help you select the right product for your job. We can also help you estimate how much of it you need, and quote you on those quantities. You can also visit us at www.epoxy.com 24 hours a day 7 days a week. You will want to sand the existing floor removing all the shine. It sounds like there was quality installation and surface prep, since you have no lifting or pealing. If you should have any that is loose you need to completely remove loose coating . Solvent wipe with Xylene. Lets solvent dry and apply your epoxy normally. CAUTION: Epoxy doesn’t like sticking to epoxy unless you do your surface prep meticulously. I always recommend doing a test patch to test your surface preparation before you proceed with doing the rest of the floor. This can be done by placing a small test patch or patches. Let them harden overnight and then try removing them with a putty knife, screw driver of similar method to insure it is well bonded. For more information please contact Epoxy.com Technical Support Department by email at: info@epoxy.com or by phone 353-533-2167. You are currently browsing the archives for the epoxy education category.